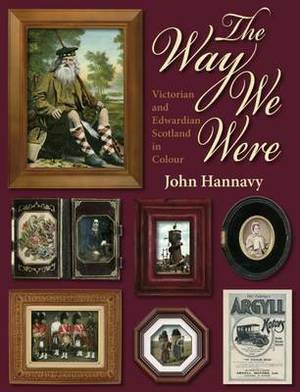 This is John Hannavy's reflective look at how Scotland was depicted in photographs and postcards 100 - 170 years ago. In many ways, it redefines our view of Scotland's past as we are familiar with seeing Victorian and Edwardian people and views in sepia, but these are in colour, adding a warmth and realism to the scenes which photographers immortalized. The subject matter of the pictures was as wide and varied as Edwardian life and work itself and it is here that the reader meets eccentrics and worthies, sees people going about their daily work, catching buses and trains, embarking on steamers, and simply enjoying Scotland's spectacular scenery. Many aspects of Scottish life are explored from people's jobs to the many ways in which they occupied their limited holiday and leisure time between 1840 and the outbreak of the Great War.These include Creating Tourist Scotland - how Victorian and Edwardian Scotland was sold to the world and the birth of Scotland's tourist industry; Scotland's Railways - the development of the railway network and some of the splendid photographs and postcards which were sold to travellers; Industrial Might; The Ubiquitous Steamer; Gateways to the World; Fisherfolk; Working the Land; The Textile Industry; Taking to the Road; The Scots at War - from the Crimean War, the first to be photographed, to the skirmishes leading up to the Great War; Out in the Scots Fresh Air; On Scotland's Canals; Village Life; Family Life; That's Entertainment; Town and City Life; What we did on Holiday and Sports and Outdoor Pursuits. Included are fine studies of the hardy Scotch Fisher Lassies who worked their way down the east coast of Britain gutting and pickling the herring; the people who lived and worked on Scotland's canals; the men who crewed the country's trains, trams and ferries, together with a host of others. In effect, it opens the book on what was perceived as an almost mystical and mysterious landscape, 'north of the border'.With almost 270 photographs, many of them previously unpublished, The Way We Were brings Scotland's colourful past to life.